Utah's national parks highlight the natural history of the formation of the Colorado Plateau. The breathtaking sceneries feature steep canyons and forested meadows, desert and alpine environments, and high elevation caves, all of which are preserved and managed by the United States National Park Service. Each year, nearly 15,000 visitors come to see the 17 national parks, monuments, historic sites and trails, and recreation areas in Utah. This article describes the most important parks, featuring the geology, history, and environments which make them special. Arches National Park, located near Moab and the center of the Colorado Plateau, has the densest concentration of natural stone arches in the world, with over 2,000 documented arches in the park, as well as pinnacles, balanced rocks, and fins. The landscape began as a sandy seabed about 65 million years ago, and a combination of sedimentary, uplift and erosional forces bulged, cracked and eroded the delicate and astounding formations. The longest of the arches is 306 feet across; the largest balanced boulder is a massive 3,577 tons. Several Native American rock art panels, images of humans, animals, and abstractions painted or pecked into the desert varnish, can found in the park. Arches National Park's austere beauty was immortalized by American writer Edward Abbey in the classic "Desert Solitaire." Abbey's book was written about the two seasons (1956–57) he spent as a park ranger, living in a government issued house trailer near Balanced Rock. Bryce Canyon National Park in south-central Utah was established in 1923, and it is justly famous for preserving the largest concentration of hoodoos (irregular columns of rock also called spires) in the world. Its unique geology includes enormous horseshoe-shaped amphitheaters carved out of the Paunsaugunt Plateau by frost wedging and rainwater. Those same forces created slot canyons, windows, fins, and hoodoos, making a landscape of mazes in a marvelous array of colors. The park's landscape features lower elevations with lush meadows fed by seeps and springs and higher elevations with arid desert environments of sagebrush and rabbitbrush. California condor, peregrine falcon and Steller's jay can be seen here, as well as the Uintah chipmunk and Utah prairie dog. Born from the ancestral Rocky Mountains, the high desert Canyonlands National Park contains a geological layer cake, exposed by a series of uplifts and erosional episodes. Fossils are abundant in the well-preserved Triassic and Jurassic sandstones, in elevations from 3,700 to 7,200 feet above sea level. The Upheaval Dome is a unique feature at Canyonlands, a dome-like structure about three miles across surrounded by a downwarp of turquoise and red rock layers. Scientists debate whether it was created by a meteor impact or a salt bubble rising from volcanic depths. Lichens of bright colors growing on the biological soil crust and often hundreds to thousands of years old are found throughout the park, tightly attached to the surface they live on or leafy bodies arising from it like lettuce. The Needles district contains some of the most relatively undisturbed areas of the Colorado Plateau, with canyons, mesas, and deep gorges. Capitol Reef National Park gets its name from the white domes of Navajo Sandstone which look like government buildings, set against rocky cliffs reminiscent of a coral reef. Sediments in the park were laid down nearly 200 million years ago, and erosion and uplift have created soaring hoodoos, massive domes, twisting slot canyons, and graceful arches. The Waterpocket Fold, a 60 million-year-old geological wrinkle (monocline) extending almost 100 miles long, was shaped by crustal forces into a steep slope ending in an abrupt cliff line. The "water pockets" are numerous natural wells or potholes that contain rainwater and provide a water source in the arid desert for wildlife. Capitol Reef was the home of the Fremont culture, Native American people who lived in the region from 300–1300 CE and were named for the Fremont River that flows through the park. They were hunter-gatherers who lived in pit houses and natural shelters, hunting deer and bighorn sheep. Rock art panels of the Fremont people are found in several locations throughout the park, images of humans and animals painted and pecked into the desert varnish. Cedar Breaks National Monument, located near Cedar City in southwestern Utah, features high elevation landscapes over 10,000 feet in height. The park includes both volcanic and uplifted rock formations, fins, hoodoos, and arches, and an amphitheater over a half-mile deep, in an environmental setting of bristlecone pines and lush meadows of wildflowers. Alpine Pond is a spring-fed sinkhole in Cedar Breaks, formed when an underground cave collapsed, leaving a high-elevation water source for wildlife. Wildflowers put on a spectacular display at Cedar Breaks, from early bloomers like cushion phlox and aspen bluebell, midsummer bloomers scarlet paintbrush and Colorado columbine, and late summer showy goldeneye and Oregon fleabane. A free software app is available to help hikers identify the many different wildflowers at the park. Abundant birdlife at Cedar Breaks includes hummingbirds, nighthawks, juncos, American kestrels, and golden eagles. The famous Glen Canyon National Recreation Area stretches for hundreds of miles, from Lees Ferry in northern Arizona, to southern Utah. Sited in the middle of the Colorado plateau, Glen Canyon features rock formations with abundant fossils of dinosaurs, fish and the earliest mammals from the Mesozoic era of 248–65 million years ago (Triassic, Jurassic, and Cretaceous periods). Microenvironments created by a series of natural hanging gardens which cling to the vertical cliff walls are fed by springs, supporting at least 10 species unique to the Glen Canyon. Lake Powell, created when the Glen Canyon Dam was built on the Colorado River in 1962, covered fossils and drowned hanging gardens, but acts as water storage for the Colorado River Compact states of Colorado, Utah, Wyoming, and New Mexico. Today it has five marinas and offers a wide range of water sports and recreation, although it has experienced severe drought in recent years. Cultural elements in the park include the Hole-in-the-Rock, a narrow crack of the canyon rim where the Mormon San Juan Mission members crossed in 1878–1879. Defiance House is an archaeological site where Ancestral Pueblo people built masonry houses, ceremonial kivas, and storage rooms in the 13th century CE. 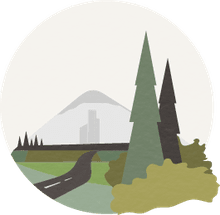 About 51 percent of the park is managed as a wilderness area—rare places which are set aside and protected from the damage created by agricultural, mining, and even tourist uses such as motorized and non-motorized vehicles. Natural Bridges National Monument was Utah's first national monument, created in 1908 and named for three majestic natural bridges, "Kachina," "Owachomo," and "Sipapu." The park's geological history begins 260 million years ago when it was a beach, the shoreline of the great sea covering eastern Utah. Since that time, the Colorado Plateau was lifted by an incredibly slow process, about 1/100th of an inch per year. Natural Bridges is now in the high desert, with deep-set canyons carved out by the Colorado River and its streams. The three bridges for which the park is named are among the ten largest in the world. The bridges are thin sections connecting remnant spires of stone above stream beds. Kachina is the thickest, while Owachomo the most delicate, and probably the oldest of the three. All of the Cedar Mesa sandstone that makes them dates to the Lower Permian period of 270 million years ago, but the bridges themselves were likely carved out in the last 30,000 years. The hills are highly variegated in color, from pale greens to orange, red, and startlingly white. The park is also dotted with potholes, tiny ecosystems where plants and animals have adapted to life in the canyons. The Timpanogos Cave National Monument, near American Fork in Utah, is named for an extensive cave system discovered in the late 19th–early 20th centuries and named after the Timpanogots Ute tribe who lived in the region beginning about 1400 CE. Speleological formations within the cave display colors of green and yellow incorporated into the crystal structure. The cave has an abundance of helictites, a type of stalactite formation that looks as if it was created in zero gravity, branching outwards in many directions. The Chimes chamber alone has hundreds of six to ten inch long helictites. The passages through the caves follow ancient fault lines, and because the elevation is quite high—the caves are in the 11,752 foot high Mt. Timpanogos—they have escaped polluted air and contaminated watersheds of lower elevation systems. Closed about six months out of the year because of heavy snowfall, the caves maintain a stable 45 degrees Fahrenheit temperature year round. Zion National Park is located near Springdale on the western edge of the Colorado Plateau of southwestern Utah. It is the deepest of the three canyon cuts called the "Grand Staircase." The Grand Canyon in Arizona is the youngest and furthest east; the top of Bryce Canyon's stratigraphy matches the lowest level of the Grand Canyon, and the top of Zion's stratigraphy matches the lowest levels of Bryce Canyon. 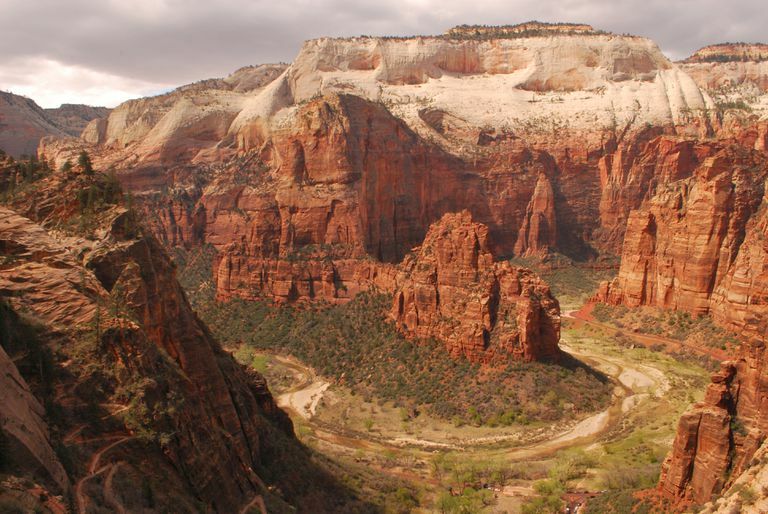 Zion's canyons were created from 240 million-year-old strata, a relatively flat basin near sea level. Erosion from the nearby mountains dumped rock and soil onto the basin until 10,000 feet of material was accumulated and mineralized. Geological forces pushed the mineralized layers upwards and the north fork of the Virgin River began its artistic efforts carving out the canyons. A green ribbon of vegetation still marks its pathway, which is otherwise surrounded by desert. The Narrows at Zion is the narrowest section of the slot canyon, with 1,000-foot tall walls where the river is only about 20–30 feet wide. The Kolob Canyon also features narrow parallel box canyons, forming majestic peaks and 2,000–foot cliff walls.